The information presented here is based on hedgehogs in general. There are always exceptions to guidelines in the animal world, but we have tried to provide tips and suggestions for a great start with your new pet. Please be advised that many books, websites, and even veterinary articles and manuals may contain outdated or inaccurate information. We strongly encourage you to refer to our Resource and Reference Guide for more details on the topics addressed here. Knowledgeable – The more you know about hedgehogs the better you will understand them and be able to meet their needs. Patient – Hedgehogs are shy and nervous by nature and the bonding will depend on your patience as they learn to trust you. Thick-skinned – Hedgehogs are prickly and you will get poked! This is something you can learn to tolerate, but if you are afraid of getting poked then hedgehogs are certainly not for you. Gentle – You must be gentle with hedgehogs if you want them to trust you. Physically responsible – Your hedgehog is going to depend on you completely for its needs. This includes its safety, food, water, and general health. 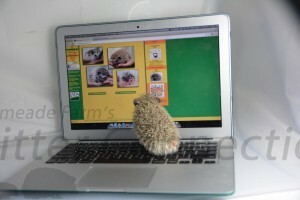 Observant – You will need to recognize your hedgehog’s needs and subtle ways of communication. You will need to ensure that your hedgehog is eating well, has healthy stools, is at the right temperature, and is in good physical condition. Financially responsible – Hedgehogs require quality food and care supplies as part of their daily maintenance. Hedgehogs will need veterinary care in the case of an injury or illness and it may be quite costly. Accepting – You must be willing to accept what your hedgehog has to offer. It will most likely never follow commands or do tricks, but its quirky habits and the affection it may share can make it quite charming.